Calvin Klein Collection and the New Museum Celebrated Launch of NEW INC.
On October 8, 2014, Calvin Klein Collection hosted an intimate dinner with the New Museum last night to celebrate cultural innovation with a special “first look” at NEW INC., the museum’s new incubator for art, tech & design. 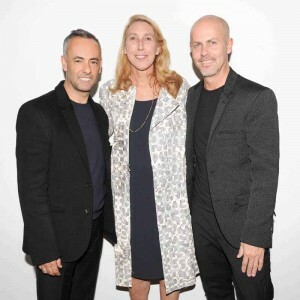 The event was hosted by Calvin Klein Collection’s Creative Directors, Francisco Costa and Italo Zucchelli, and the New Museum’s Toby Devan Lewis Director, Lisa Phillips. The evening kicked off with cocktails at NEW INC., where guests mingled with the inaugural class of members and received a sneak peek at some of the projects that are currently being developed in the recently-launched incubator. 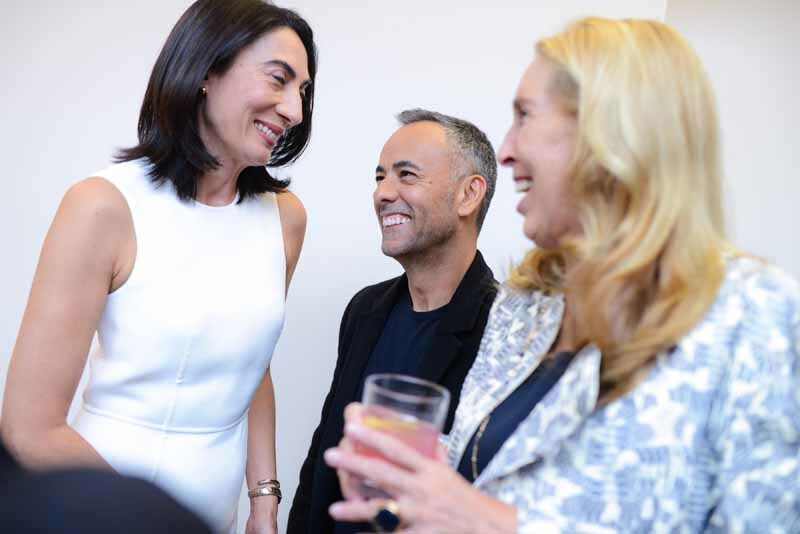 The evening continued next door in the New Museum’s Sky Room with a private dinner for guests from the worlds of fashion, art, design and technology. The space, which allows stunning wrap-around views of Lower Manhattan, was enhanced by an immersive video installation created by Dutch artist Rafaël Rozendaal in collaboration with 3LDNYC, mapped specifically to the Sky Room interior. As the evening went on, the installation progressed through a cycle of vibrant and dynamic sequences that filled the floor-to-ceiling windows with graphic color and receded to give guests city views. For the evening, those wardrobed in Calvin Klein Collection included Ms. Phillips and Mr. Rozendaal, as well as Zachary Quinto, Katherine Waterston, Liu Wen, Gigi Hadid, Bella Hadid, Laura Love, Vanessa Traina Snow, Fabiola Beracasa, Leigh Lezark, Anh Duong, Marilyn Minter, Jeanette Hayes, Zani Gugelmann, Meredith Melling, Valerie Boster and Cecilia Alemani. Each of the women’s looks were designed by Mr. Costa, and the men’s looks were designed by Mr. Zucchelli. 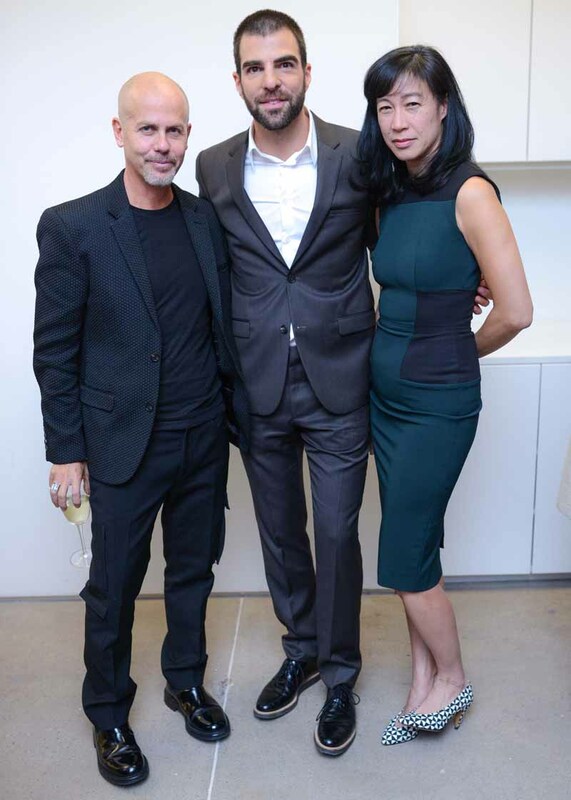 Other notable guests in attendance included Karen Wong, Lauren Cornell, Julia Kaganskiy, Jen Brill, Max Snow, Neville Wakefield, Casey Fremont, Massimiliano Gioni, Tim Barber, Camille Henrot & Joakim Bouaziz, Shelley Fox Aarons & Philip E. Aarons, Ryder Ripps, Joan Lazarus, Marc Kushner & Christopher Barley, Kalup Linzy, Takeshi Murata, Xavier Cha, Jacolby Satterwhite, Mel Ottenberg, Rachel Stern Haot, James-Keith Brown & Eric G. Diefenbach, Kate Crawford and Calvin Klein, Inc.’s Steve Shiffman and Kevin Carrigan. Conceived by the New Museum in 2013, NEW INC. is the first museum-led incubator—a not-for-profit platform that furthers the Museum’s ongoing commitment to new art and new ideas. Bringing together an interdisciplinary group of creative practitioners working at the intersection of art, design, and technology, NEW INC. serves as a shared workspace and professional development program that helps foster the investigation of new ideas and sustainable business practices. The eight-thousand square-foot space is located in the Museum’s adjacent building at 231 Bowery. 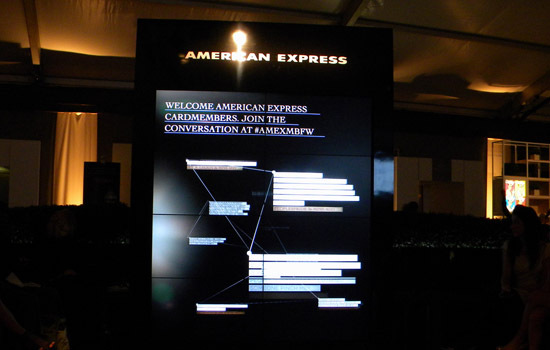 The inaugural group of NEW INC. Members are pursuing various enterprises spanning a broad range of fields, including data visualization, environmental design, interactive installations, computational photography, wearable technology, experimental architecture, and spatial sound engineering. NEW INC. was cofounded by Lisa Phillips, Toby Devan Lewis Director, and Karen Wong, Deputy Director of the New Museum, and is led by Director Julia Kaganskiy. Supporting the development of NEW INC.’s program is an Advisory Council of leading luminaries assembled for their extensive expertise in matters pertaining to the incubation of creative businesses. For more information visit newinc.org and newmuseum.org.